Observing over time helps us identify and measure events and changes in living things, materials and physical processes and events. Observations may take place over time spans from minutes or hours, to several weeks or months. Observing over time provides opportunities for children to be actively involved in making decisions about what and how to observe and measure, and the best ways to record the changes that occur. These types of enquiries provide rich contexts for children to learn about the importance of cycles, systems, growth and decay, and other types of changes. As the signs of spring are getting stronger everyday, and because I do love a daffodil, I thought I’d take the opportunity to do a little bit of observing over time with a 99p bunch of daffodils from the local supermarket. We watched these little beauties changing over a period of 12 days, taking 1 photo a day, and using PicCollage to put our timeline together. I think the result is great! It really shows how the daffodils have changed over time. It would be interesting to continue to watch what happens after day 12 if they were placed on the compost heap. As science week draws ever closer and teachers are rushing to find things to do, why not suggest this simple little activity? It provides for a multitude of scientific skills e.g. observing, describing, comparing, measuring (if you want to), predicting, explaining and communicating, all for the price of 99p, and the effort of buying some daffodils and sticking them in a jam jar at the front of the class. Take one picture a day, get the children to tell you what they notice, write it on the IWB alongside the photo, and make a class big book at the end of the week/fortnight. Why not make a whole school project of it and show progression in science across school? It would make a great display to have pupil paintings of daffodils, alongside photos, comments, predictions, descriptions and explanations. 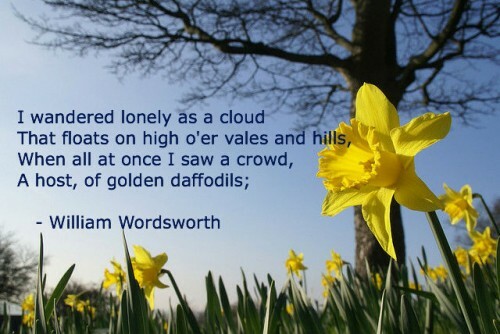 For a bit of secondary research, why not find out more about daffodil growing in the UK? Those of us who find it easy to access the creative sides of our brains often use that creativity for positive ends, but sometimes we can turn those talents to worry and anxiety. – Oooh, that roof doesn’t look right…I’d better keep an eye on it. – Hmm…there’s water coming down the inside wall. Better mop that up. – What if we can’t get a builder? What if the roof blows away in the wind? What if I can’t afford to fix it? What if the plaster gets too wet to support the window? What if the window falls out (why would it)? What if the house falls down? Quite quickly I’d used my creative brain and its fairly constant supply of curious ‘what if’ questions to send myself into a downward spiral of panic, anxiety and sleepless nights. What if my children (either your own or in your class) were perfect exactly as they are? What if my children/colleagues are doing the very best they can, given the resources/experience/expertise etc. that they have? What if we talked to our children/colleagues about the things they are doing well? What if we assumed that inside each and everyone of us we have everything we need to be amazing? Inside a tiny acorn lies a great oak, so why not in us? What if I was kind to myself today and acknowledged just how great I am? What if I only said positive things today? What if I trusted my children/colleagues? What if I allowed myself to have fun today? What if I just gave it a try? What if I went with the rhythm of my children today? What if I dared to be different? So far, I’ve been playing with this idea and seeing where it takes me. It’s fun, refreshing, sometimes a bit scary, but always full of possibilities. Have a play with ‘what if’ and see where it takes you. Another bloomin’ Christmas…so spruce it up with some science! As the Christmas season is drawing nearer, I decided to use it as the focus for some recent science CPD. From there my Christmas science ideas have snowballed (oh dear…), so I thought I’d present (get it?) them to you here so that you can have a go with your class. Watch the advert for a third time and ask children to add detail to their original notes e.g. Robin peeping out from an old-fashioned kettle; Bird table with a welcoming mince pie feast; vast crashing waves almost drown the exhausted bird. Your list of ‘noticings’ should read like a poem. Edit and refine as necessary. NB: if you’ve never used the ‘Art of Noticing’ before you will need to teach your class how to do it, or write one together for younger/less experienced children. This activity is great for AfL and also for getting children the children to use ‘because’. The back of the book contains information about migrating robins. Create statements and ask the children to use to text to find out which are true or false. Find/write texts about any other aspect of the book/video and repeat the above! What’s not to love about a mince pie! Not only do they taste delicious, but they also contain a myriad of scientific opportunities. Here are a couple of simple ideas to get you started. You can use a simple comparison grid (see below) to collect their ideas and then write a piece of prose using all the connectives, comparative phrases etc. required of your by SPAG. Describing, sorting and explaining – mince pie dissection! Get your children to dissect a mince pie and sort it’s component parts. Can they think what the ingredients list would be? What were the ingredients like before they were baked? How are they different? Why? Try downloading Kitchen Concoctions for further information on mince pie dissection. Which stocking holds the most presents? Which stocking is the stretchiest? Which is the best paper for wrapping our present? How many paper chains can you make in 60 seconds? Wishing you all a marvellous end to the term, and a very peaceful holiday. As you begin this new school year with the inevitable focus on development plans, OfSTED, assessment, the curriculum, new initiatives and so on, remember the most important element of your job is the people. Those little human beings in front of you in the classroom, playground or dining hall, the bigger human beings around you in the staff room, and those human beings waiting in the playground or at the school gates. Inside each and every one of those people is a star that is aching to shine its brightest. This star represents the true essence of who we are. It is beyond labels and defies concrete description. It is more of a feeling. It is the part of you that feels joy, that wants to dance when it is excited, it is the part of you that says ‘yes!’ when given the choice to do something it loves, it is that part that grins its head off when it is happy, it is sparkle in the eyes of someone who has been seen. Believe in the human potential for greatness. You have to believe that everyone CAN. See the shiny star. You have to see beyond the labels, behaviours and outward appearance. Once you’ve made the decision to do these two things the rest is simple. On meeting your pupils, colleagues and parents, look them in the eye, smile and say hello. You may not even need to talk. Sometimes a look or gesture is enough to connect you. Every human soul is seeking connection. Without it we feel lost, angry, confused or lonely. Starting school can be challenging for pupils, parents and teachers, so I urge you to take the time to connect with every one you encounter so that they feel seen. You’ll notice that as their star begins to shine, so will yours. It is the best investment you can make. P.S. Remember to connect with your own shiny star too! When discussing the changes and challenges in life with my coach, she often talks about the autopilot on a plane that makes continuous adjustments to speed, altitude and attitude of the aircraft so that it maintains a constant profile and arrives safely at its destination. Today I was teaching a class of Y3 students who were learning how sedimentary rocks were formed. The teacher and I had planned a lesson based upon their previous learning. There was a hook, a purposeful outcome, some discussion and thinking time, and most exciting of all a model based on making a sandwich. All should have been plain sailing. However, we quickly discovered that, despite previous work , the children were only able to tell us one fact about sedimentary rocks. There was adjustment #1. Oh…they don’t really know anything. Hmm…how I can make this simpler and start from where they are? I decided that I’d have to do a bit of direct teaching using our model of a sandwich to explain the various layers of sedimentary rocks. Well, that was fine and the children were enjoying the smells of the various ingredients. However, sooner or later, we realised that the vocabulary and concepts weren’t really sticking. Adjustment #2 add in some actions, repetition and almost a song (thankfully I thought better of the singing) and the learning was starting to stick. Schools are incredibly busy places, and every now and then it is important that leaders (at all levels) take time to stop and reflect on the journey so far, the actions they have taken, and their impact. Whilst leading such a session this week (helped by my trusty felt-tip pens, paper and sticky notes), I was privileged to hear an account of inspiring, unassuming leadership that, to my eyes at least, can be captured in just 5Cs. Care – this HT cared passionately about everyone in the school community – pupils, parents, teachers, grandparents, and local people. Visitors to the school commented on the warm and welcoming atmosphere (as did I). Staff talked about feeling valued and being regularly thanked. Clarity – every action in this school has a clear purpose, and both the HT and the staff knew exactly WHY they were doing things. Having supported the T&L leader to write a learning policy using Simon Sinek’s ‘Golden Circle’ approach, which emphasises starting with WHY, I was very pleased to hear this! Can-do – No problem, big or small, is too much for this HT. Her motto seems to be ‘right, let’s deal with it’. Her outlook is optimistic and her belief in the whole of the school community is positively palpable. Many leaders would drive through changes with fear or power, but not this leader. Her decision-making is backed by her belief in people’s potential, coupled with the fact that, as I’ve said above, she obviously cares about and values those around her. Consistency – it was clear to me that a seam of consistency ran through lots of the discussions taking place at the school – consistency of approach, expectations, staff and much more. Many things have been put into place that provide structure for the pupils, parents and staff, which makes the school a calm and safe place to be. Courage – the challenges faced by this particular leader are huge, and to tackle them (especially as a young leader) takes great courage. Lao Tzu once said ‘From caring comes courage’. Well, given this lady cares so much and is so passionate about her new school, perhaps Lao Tzu is right! I really was in awe of this leader as I left for the day, and have been basking in the glow of her inspiration ever since. I’ve also been applying the 5Cs to my challenges, and I am sure that it’s going to pay off very soon. With thanks to Rimah Aasim, Worth Valley Primary School for her time.